Hardin Towell and Jennifer Gates' Man In Black finished the day wearing blue after the $50,000 Ariat Grand Prix CSI2*, held February 2, in Wellington, Florida. This was Hardin's biggest grand prix victory to date after he and Man In Black had been knocking at the door for the past six months. Week four of the 2014 FTI Consulting Winter Equestrian Festival (FTI WEF) concluded with the exciting $50,000 Ariat® Grand Prix CSI 2* on Sunday afternoon held on the grass derby field at The Stadium at Palm Beach International Equestrian Center (PBIEC). An exciting eight-horse jump-off finished with a win for Hardin Towell (USA) and Man in Black, with Andres Rodriguez (VEN) and Caballito in second and Lauren Hough (USA) aboard Ohlala finishing third. Leopoldo Palacios of Venezuela was the course designer for week four's finale event. There were 45 competitors on the beautiful grass derby field with eight clear trips in round one to advance to the tie-breaking jump-off. In the second round, four entries cleared the short course without fault. Lauren Hough set the pace with her clear round in the jump-off aboard The Ohlala Group's Ohlala in 43.24 seconds to eventually finish third. Andres Rodriguez and Arao Enterprises LLC's Caballito upped the ante with their time of 42.94 seconds to end up in second place. Roosje Brouwer (NED) and Stal Heijligers and A. Vogels' SRI Aladdin also completed a clear round over the short course in a slower time of 49.56 seconds to earn fourth place honors. Last to go in the second round, Hardin Towell and Jennifer Gates' Man in Black got the winning edge, completing the course in 42.47 seconds. Man in Black is a 12-year-old KWPN gelding by Gentleman x Calvados that Towell has been riding for one year. Gates showed the gelding in the Junior Jumpers last year and then handed him over to compete at the higher level with Towell. Sunday's win was the biggest of Towell's career - his second grand prix victory, and his first major win at the FTI WEF. The rider is 26 years old and from Camden, South Carolina. "With him in the past year, probably starting last year in Thunderbird, I was really close in a lot of classes and I would go too fast," Towell said of his partnership with Man in Black. "On Thursday I was quite close to winning and I knew I should slow down, and I just kept running down the last line. I'm just glad I beat Andres, because in L.A. in November I was winning the World Cup class and was really fast, and everybody was like 'Congratulations you won!' and I said, 'No, Andres still has to go,' and he beat me by about one-tenth of a second. I think today was really close again, so I'm glad I could repay him the favor!" "It feels very good (to win), and especially since I just started showing him," Towell noted. "He's a little bit strong. I have had a lot of trouble the last six months finding the right bit. I have changed a lot of bits and probably made a lot of mistakes using the wrong bits, but I think we have kind of figured it out. He's a really sweet horse. He is very brave, very scopey, and this is a great venue out in this grass field. He is always good at places like that. He is so brave that he is a little bit impressed out here sometimes, so today he jumped unbelievably. I could not ask for any more; he was fantastic." Commenting on his winning round in the jump-off, Towell detailed, "I thought in the jump-off I was a little bit smarter. I thought about running and being crazy, and then I remembered, 'You know what, let's just try to be clean,' and I thought I was close enough. I landed and I actually saw a leave out to the last jump, which maybe six months ago or Thursday I would have done and knocked it down, but I decided to try to cut it close and win by just a little bit." Towell got to compete at some different venues around North America this past year and explained that the experience has helped him grow as a rider. "It helps a lot," he stated. "I went to different places and competed against different people. My whole life I have kind of stayed in the Southeast. I have never had that opportunity, so I met a lot of new people, and it was nice showing at Spruce Meadows and everywhere we went. I have had a great last year; it has been very lucky. Jennifer has been great the whole year and I want to thank Chris, my barn manager, and my mom and dad, and my sister. We just have a very good team." To read about Hardin's victory in the Palm Beach Post, please click here. Finally Farm's ribbon count wasn't just limited to the Grand Prix ring this week. Brie Tiffany also collected top honors in her respective section, earning the Adult Amateur, 18-35, Hunter Championship in Section B aboard her MTM Cash. "Brie rode him in the Pre-Greens this week, and he started out a little overwhelmed on Wednesday," said trainer Liza Boyd. "But she persevered and got him through, and by the weekend he just marched around the Grand Hunter Ring and won in the adults. They ended up champions, and I couldn't be more proud of her. It was the most amazing turnaround." Brie purchased MTM Cash from Tracey Fenney last fall during the Capital Challenge and is still getting to know the now 7-year-old. "We are very excited and impressed by him and so happy for Brie," she added. Liza also cheered on her friend and fellow professional Erynn Ballard as she guided some of the Finally Farm mounts in the open sections. Erynn showed Quatrain for the first time and picked up ribbons in the Performance Hunters. "It was fun to watch him go with another professional," said Liza, who is pregnant and currently out of the saddle. "When I told her she was riding Quatrain, she said, 'Oh, that's a lot of pressure!' She did a great job, and it was fun to see how far he's come along and to just sit back and enjoy it. Quatrain and [owner] Laura Critz also earned excellent ribbons over the weekend in the Junior Hunters." Hardin also picked up the ride this week on Emma Wilson's Ajax and earned top calls in the competitive Pre-Green Hunter section. "It was also fun to watch Hardin ride a hunter," said Liza with a laugh. "He was second and fifth the one day he showed [the second day was canceled due to torrential rain], and that was exciting to see this nice young horse that we imported last year step right in and get good prizes. Hardin hadn't ridden a hunter in a long time, but it all came back to him easily. I teased him and said, 'It was nice to see you bend over and give that horse a nice release!' "
In the Equitation, Addison Byrd jumped to an impressive eighth-place in the USEF Medal. "This is her first year in the big equitation, and she's doing wonderfully," said Liza. "It was a hard course, with a lot of tough questions, but she walked right in and nailed it." Finally Farm's success went from tall to small this week, as Catherine Sharp continued her success in the Small Pony Hunters, taking ribbons on Church Mouse and I Candy, respectively. Posted on February 3, 2014 by Tricia Booker and filed under Horse, Horse Show and tagged horse horse show Winter Equestrian Festival Ariat Grand Prix Hardin Towell Finally Farm. Finally Farm student Erin McGuire and her Casallo earned a variety of top honors at the Capital Challenge Horse Show, including the Large Junior, 16-17, reserve championship as well as the Large Junior Owner/Rider Award, presented by ESP Farm. In a super competitive section, Erin and Casallo won the Handy Hunter class and placed third in the Stake and the first over fences class. A sixth-placed finish in the under saddle added some green to their primary ribbons and the tricolor ribbon to the Finally Farm banner. Congratulations! Watch Erin McGuire and Casallo's winning Handy Hunter round at the Capital Challenge. Posted on October 11, 2013 by Tricia Booker and filed under Horse, Horse Show and tagged horse show hunter Capital Challenge junior hunter. A gallery of images from the 2013 WCHR Professional Finals, held October 4 at the Capital Challenge Horse Show in Upper Marlboro, Maryland. Posted on October 11, 2013 by Tricia Booker and filed under Horse Show, Horse and tagged horse horse show Capital Challenge WCHR Professional Finals hunter. 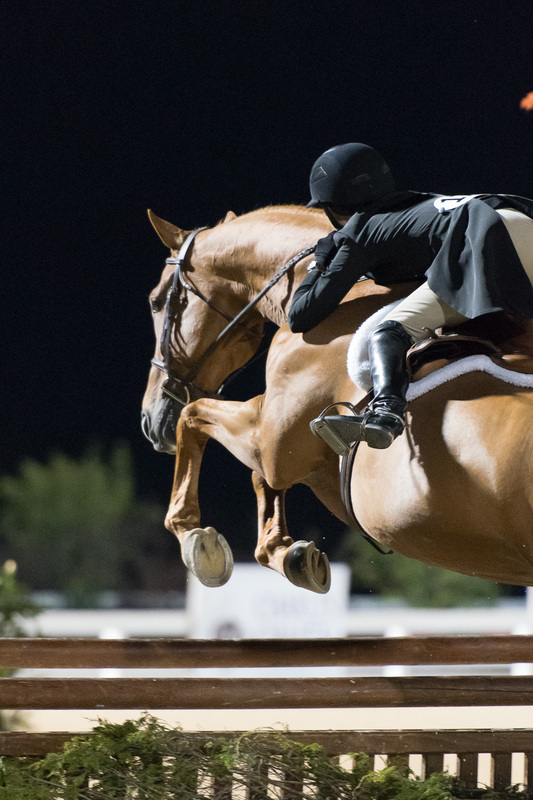 When Liza Boyd heard about the new format for the $5,000 WCHR Professional Finals, she had a premonition that this might be her year. The six top riders in the WCHR Professional National standings qualified to compete over two rounds on unfamiliar horses and then rode their own horses for the third and final Handy Round. "I brought Quatrain here specifically for this class and the Pro Challenge," she said of the 9-year-old Westphalian gelding she owns with her parents and Janet Peterson. "I'm so fortunate to have him, and I know him so well and trust him." That familiarity turned out to make all the difference in the Handy Round, as Boyd earned the night's highest scores of 95, 95 and 95 to clinch the victory with an overall score of 274.66. Her solid performances aboard the borrowed horses Crack On and Corduroy in Rounds 1 and 2 had put her third going into the Handy Round, just within striking distance. "So, Quatrain won this class for me, for sure," said Boyd. "He's amazing, and I'm so proud of him. He's really coming into his own, and I kind of knew early on in the week. He got an 88 and won the handy in the High Performance section, it was pretty much a no-brainer that I should ride him." Boyd's trip to the winner's circle had a few nail-biting moments, though. She had to place eighth in the WCHR Professional Challenge on Wednesday to qualify for the Professional Finals, but after a rider error in the first round she just squeaked into the second round in 12th. Liza and Quatrain showed off their handiness with tight turns. "I've never worked so hard for an eighth-placed ribbon," she said with a laugh. Scott Stewart, of Wellington, FL, took the lead in the first round aboard the borrowed mount Contelido and maintained that position with a second solid round aboard All The Right Moves. He returned for the Handy Round with Fashion Farm's Declaration, but a slip on the turn from fences 1 and 2, and a few bobbles later in the course, earned a score of 76 in the round and a 257.66 overall for sixth. "I chose Declaration, who I've had for a really long time," said Stewart. "He's usually really, really good in the handy rounds-until tonight. I don't know what set him off. He's usually perfect. I'll have to try again." Amanda Steege, of Far Hills, NJ, was the sole rookie in the field of veteran professionals, and she moved up in the Handy Round from fourth to second overall with a stellar performance aboard Zidane. "This is the first year that I've shown him," said Steege. "I show him in the High Performance, and I did my first [USHJA International Hunter] Derby Finals on him this year. [Owner] Susan Darragh shows him in the Modified Adults. He's totally dependable, and I knew he would help me out when I needed it." Peter Pletcher, of Magnolia, TX, returned to the Handy Round in sixth place, but an impressive performance with Eva Bisso's Aura vaulted him to third place overall with a score of 87.33 and an overall total of 262.49. 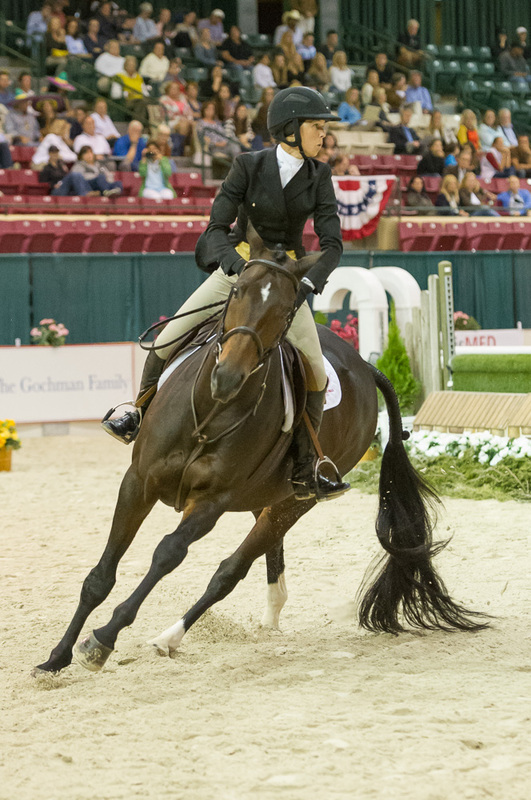 The 2013 WCHR National Professional Champion Kelley Farmer, of Keswick, VA, finished fourth overall with 261.16. John French, of Woodside, CA, dropped down in the standings to fifth during the Handy Round (257.83) after Lily Blavin's Sander stepped off his lead. Liza and Quatrain successfully navigated the bounce. With just 6.5 points separating the six riders going into the Handy Round, those third-round performances shuffled the standings tremendously, providing for an exciting finish for competitors and spectators. This year's horses were generously donated by: East Coast Sport Horses (All The Right Moves); Georgy Maskrey-Segesman and Savannah Dukes (Contelido); King's Wood Farm, LLC (Corduroy); Old Willow Farm & Emma Heise (Crack On); Katherine Boettcher (Lamont); and Alexis Graves (Copperfield 39). Contelido, the horse donated by Maskrey-Segesman and Dukes, earned this year's Far West Farms Perpetual Trophy awarded to the high-score horse of the competition. Contelido, trained by Karen Healey, achieved an average of 90.83 with rides by Stewart and Farmer. With this victory, Boyd, of Camden, SC, will have her name engraved on the All The Way Perpetual Trophy. She also won prizes from USHJA/WCHR sponsors Blue Ribbon Blankets, the Official Cooler Sponsor of WCHR and Charles Owen Inc., the Official Helmet of the USHJA. Posted on October 10, 2013 by Tricia Booker and filed under Horse Show, Horse and tagged horse horse show WCHR Capital Challenge hunter. After three previous appearances in the $170,000 USHJA International Hunter Derby Championship and a second- and third-placed finish, Liza Boyd was hoping for a little luck this time. And, today, it came in the form of a four-leaf clover given to her by Jen Alfano, last year's winner. The good fortune carried through and Boyd and Brunello, her 15-year-old Hanoverian gelding, jumped to the top of the $120,000 Tier I section of the USHJA International Hunter Derby Championship, held at the Kentucky Horse Park in Lexington. "I'm really happy for the horse. He deserved it," said Boyd, of Camden, SC. "He's an amazing horse." Scott Stewart, who held the top spot after yesterday's Classic Hunter Round with Garfield, couldn't quite repeat the performance tonight under the lights and placed eighth. Stewart didn't go home empty handed, however, as he guided Fashion Farm's Declaration to victory in the $10,000 Consolation Round held earlier today. Boyd and Brunello placed second in the Classic Hunter Round yesterday with 276 points, 10 points behind Stewart and Garfield. Brunello's Handy Hunter Round tonight was brilliant and scored 301.75 points, giving them the win. Tonight's competition at the Kentucky Horse Park featured a beautiful Tier I and II Handy Hunter course by acclaimed designer Steve Stephens. The fences and decorations created a feeling of cantering through hunt country, with natural jumps of planks and logs, abundant trees and shrubbery and decorative elements such as carriages and barns. The fence heights ranged from 3'6" to 4' and offered riders an opportunity to pick up bonus points by taking any one or all of the four option fences set at a minimum of 4'3". The 11-obstacle course featured several areas where riders could show off their handiness with tight turns and rollbacks, a trot fence at 4, and for the grand finale riders could choose the safe route over a 3'6" oxer or an impressive 4'6" higher option set in the center of the arena, which offered spectators in the stands a beautiful view. The final fence became an influential part of the course, with multiple rails down. Boyd and Brunello had a light rub there but otherwise their performance was spectacular. Liza Boyd and Brunello in action. "I tried to listen when Steve was talking about how he wanted the course to ride," said Boyd of her strategy. "He said, 'This is a jumping contest, and I don't want the course to win. I want the riders and the horses to win.' There were no traps; it was really well done, and I took that to heart. He designed it, and he knew what he had in mind, so that helped me. You needed scope and careful, which is what these derbies are supposed to be." Kelley Farmer and Mythical, co-owned by Kenneth and Selma Garber and Larry Glefke, won the Tier I Handy Hunter Round and leapfrogged up the standings from sixth to second overall with 571.75 points. Farmer, of Keswick, VA, was thrilled with the First Year Green hunter in his first Derby Championship. "What about Mythical? He's mythical, isn't he?" she said with a smile. "For a first-year horse, he's an amazing animal. He's done everything. He tries to step up on the biggest stages. I moved up from sixth to second. He's an amazing horse who doesn't let you down." New this year was the Tier I and Tier II Handy Hunter Round format. The top 30 pairs returned for action in the $120,000 Tier I Handy Hunter Round, with 14 Tier I entries qualified and 16 Tier II entries qualified. The $40,000 Tier II Handy Round included a field of 25 riders, with nine jumping for Tier II money only. The scores for the 16 Tier II entries in the Tier I Handy Hunter Round carried over to the Tier II Handy Hunter Round and Overall standings. The judges included Rick Fancher and Jimmy Torano (Panel 1), Danny Robertshaw and Don Stewart (Panel 2), and Carleton Brooks and Ralph Caristo (Panel 3), who were placed in strategic positions around the Sheila C. Johnson Ring at the Rolex Stadium. 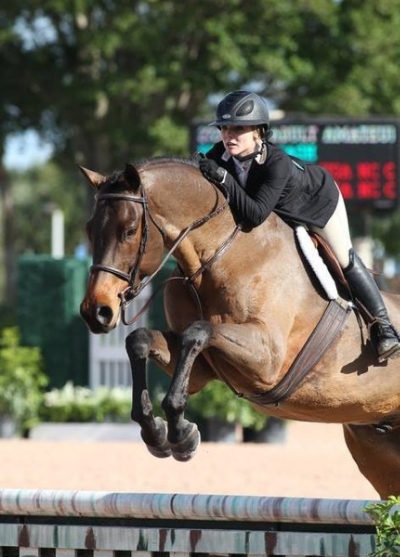 Kelsie Brittan, 17, of Westlake, TX, rode Argentum, a 12-year-old warmblood, to top honors in the $40,000 Tier II USHJA International Hunter Derby Championship with a gorgeous Handy Hunter Round, under the watchful eye of trainer Peter Pletcher. "I've just been doing juniors on him this year, and every now and then there would be derby in Texas or Michigan and I'd do it," she said. "I've been a little bit of a chicken; I've been doing the small ones and playing it safe. Since I was here, of course, I thought I'd be like all the top riders and do all the big jumps. I really trust him, and yesterday, too, I just let him show off and tried not to ride him like a junior hunter anymore and more like a derby horse. It's a big adjustment for me." Judge Danny Robertshaw was impressed with Brittan's partnership with Argentum and praised her after the class. "I saw her in the pouring rain in Florida [this winter], and I was talking to her mother. And I said it then, and I said it yesterday and today. It's fun when you see a horse that loves his rider as much as Argentum loves her." Shawn Casady, 19, of Harriman, TN, guided HJ Group LLC's Ascot to second place in the Tier II USHJA International Hunter Derby Championship. Posted on August 20, 2013 by Tricia Booker and filed under Horse Show, Horse and tagged hunter horse horse show hunter derby USHJA Finally Farm.